A big expense with any move are the boxes. At least that would be a big expense if you were buying them from a package store. Instead, you should make use of every potential storage item in your home. For instance, all your suitcases, laundry baskets and even trashcans can be utilized for packing. In the case of the laundry baskets and trashcans, you might want to fill them up with light objects and then shrink-wrap them. Also, be sure to look on Craigslist. 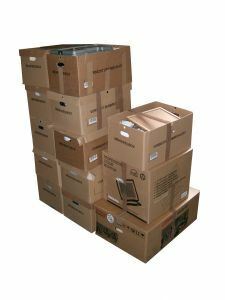 There are always people who have just completed the move that want to get rid of their boxes and offer them free to pick up. The perfectly packed box is one you can shake and not hear anything rattle inside. That’s because it is packed completely. This doesn’t mean overloading a box but instead filling up the empty spaces with things like your clothing. T-shirts, socks and sweaters make great packing material. Just be sure that every box is able to be easily lifted. At the end of your moving day, the last thing you want to do is unpack a single box… With one exception. You should have an overnight box that will contain all the stuff you need to get ready for work the next day. That box should also include sheets for the bed, pillow and maybe even your coffee machine. You definitely want to put a label on the box as to where it is supposed to be dropped off. But you also want to include an inventory. This will help you determine the priorities for unpacking. As you go through all your stuff, you will probably find a lot of things that you can do without at the new house. Your instinct might be to have a yard sale to try and get rid of that junk but that’s not always effective. You might make a couple of bucks but waste an entire day and still be left with a lot of rubbish. Instead, turn it all over to Junk King Minneapolis. These are the professional junk haulers can quickly clear out any pile of rubbish you want to get rid of. You can even leave behind the stuff for Junk King Minneapolis to pick up after you moved out. Don’t bring rubbish with you to your new home. Give it all to Junk King Minneapolis today. This entry was posted in Minneapolis Junk Hauling and tagged clutter, Junk King Minneapolis, next move, rubbish, smart move on June 30, 2017 by Junk King. Last updated July 1, 2017 .